There are lots of angel buttons to choose from these days; pick your favorite and turn it into an homemade guardian angel pin in this easy craft project. 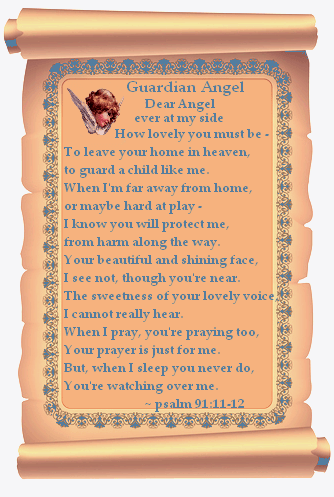 Click on this image of the Guardian Angel Psalm scroll to open and print. These beautiful pins are very easy to make and inexpensive too. If you’re making this as a little gift for someone special, you might also like to include the printable Guardian Angel psalm. Photo 1 shows the type of pin used and Photo 2 shows how to assemble them. The first thing you need to do is remove the button loop at the back of the button. To do this, cut the loop off, as close to the button back as you possibly can, using wire cutters. The loops are usually very easy to cut off and require little effort. You will have a little sharp edge where the loop was. Using a little sandpaper, gently sand away the sharp edges. The sharp edges will remove quickly, so go slowly. Glue the pin assembly to the back of the pin as shown in Photo 2. Allow your glue to dry at least 24 hours before wearing these pins.